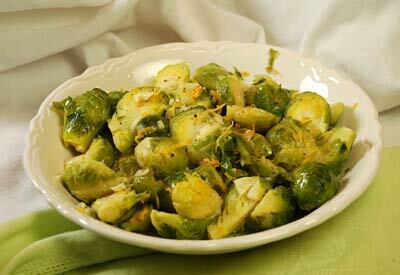 THIS is how brussels sprouts should be prepared - enjoy! Place sprouts and garlic in large pan with enough water to almost cover and bring to a boil. Cook for about 10 minutes or until tender. Drain sprouts and place in a shallow roasting dish. Cut sprouts in half and drizzle with oil. Broil just until the outer leaves begin to brown. Season with salt and freshly ground pepper and toss to coat. Pour into serving dish and sprinkle with orange zest.